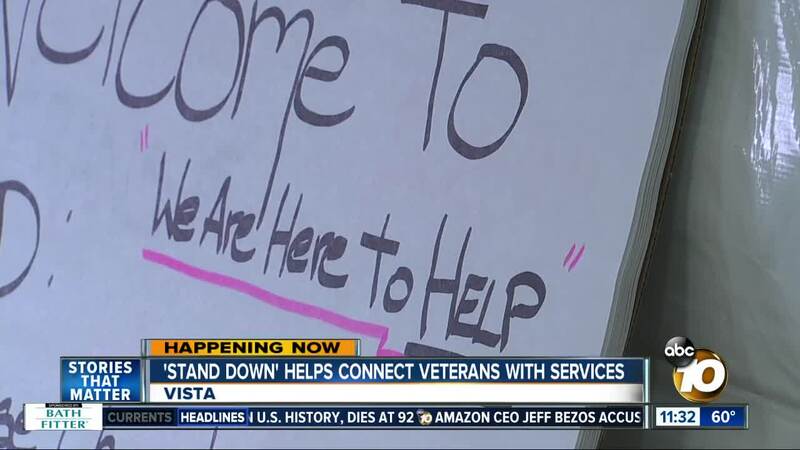 SAN DIEGO (KGTV) - The annual North County San Diego Veterans Stand Down event is helping connect homeless veterans with much-needed services for the next four days. Vans have been picking up the veterans and their families from different locations in the county and bringing them to Green Oak Ranch in Vista. About 274 attendees are expected this year. The veterans and their families are given cabins to sleep in, meals, clothing and a variety of different services to help them physically and mentally. Pets are also welcome. A number of service providers are on site to give the veterans vision, medical and dental exams. Eyeglasses are made on site and given to the vets in just a couple of hours. Veterans can also get help with legal and court services. Smetana said it’s something he has been looking forward to. The four-day event is also a chance for hundreds of volunteers and sponsors to give back to the men and women who bravely served our country, but have fallen on tough times. “You served your country, now please be served,” said Smetana, encouraging other veterans to come join. The event began Thursday and will go through Sunday. Any veteran who wants to join can just show up to the Green Oak Ranch.